Apparently the Rangers remembered this batflip as well. Many expected the fireworks to happen in the first series they played. But surprisingly, nothing even happened at all. But that did not mean the Rangers forgot about the theatrics of Bautista. The Rangers and the Blue Jays played their last series of the season this weekend. In the last game on Sunday, the game was still in the balance when Rangers pitcher Matt Bush nailed Bautista right in the rib/side area. The pitch had to sting, as it came in at 90+ miles per hour, but Bautista shrugged it off and trotted down to first base. But little did we know that more fireworks were coming. This is exactly what happened next. A ground ball was hit to third base and it was a perfect double play ball. But that did not happen exactly because Rangers infielder Rougned Odor was taken out by a perceived dirty slide by Bautista. 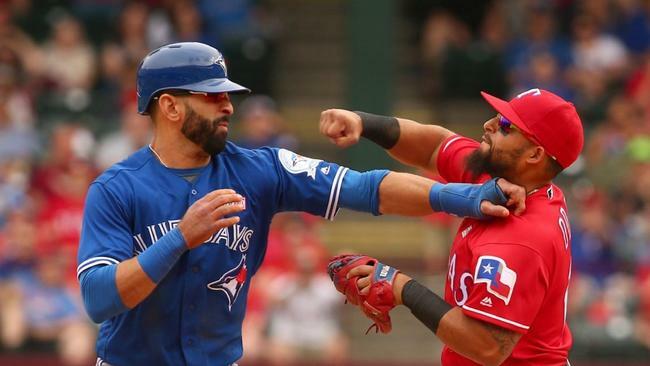 From there, Bautista was clocked with a right to the jaw and an all-out brawl broke out. The Rangers ended up winning the game, but they may have lost ultimately. This type of actions of retaliations because of batflips has to be the stupidest thing in sports. And yet again, another unwritten baseball rule has reared its ugly head. The Rangers got their revenge. And looking at the reactions of some of their fans, they were happy to get revenge on Bautista. Who knew a batflip in the playoffs would allow them to hold on to a grudge for so long? Well, I hope the happiness of the retaliation and punch against Bautista was really worth it to Bush and to Odor, because they will undoubtedly pay for it. Bush just arrived to the professional ranks and has had a long road to get there after all his legal and behavior issues along with a position change. Needless to say, many looked at his story as a great one when he was called up. And with him drilling Bautista, his teammates definitely love him more right now. But his short callup is about to end in a suspension more than likely. And with that, he could miss the rest of his chance to impress the team. With this being essentially Bush’s last chance, he really did not need to be involved in this at all. But of course, when baseball’s unwritten rules happen, you have to answer right? So Bush started this one and he more than likely will be seeing some punishment from this one as well. And while he is suspended, he better get ready to see someone take his spot and hope that the callup does not end up outperforming the three days he had to show the Rangers he was worth the callup. Odor, for his part, was fired up because of the slide of Bautista. Of course, he was a part of the team last season that saw the batflip and that could have been still in the back of his mind. But when the slide happened, it allowed him an opportunity to confront Bautista like he probably wanted to do in Toronto in the playoffs last season. And with one solid punch, he let all he had harbored inside against Bautista out. Odor went from a major league infielder to Canelo Alvarez in a matter of minutes. And with that action, he probably just threw away a portion of his season. While it can be understood his frustration, he could have held his cool more. And as a result, he will more than likely get at least a ten-game suspension. That may not seem like a lot when compared to a 162 game season. But let’s break this down just a little bit. The Rangers are in a tight race with the Seattle Mariners right now and they lead by half a game. With Odor out, the Rangers lose a leadoff hitter that was off to his best start of his young career, hiting .286 with seven homeruns and 21 runs batted in. And defensively, they lose a very solid infielder. With him gone (whenever he gives up what is expected to be a fight on the length of the suspension), the Rangers will have to do a little juggling of their lineup. And in that stretch, that could cause some rough patches for the Rangers. And we all know that one game could mean the difference between the playoffs and the offseason. Injuries are something that you cannot control, but emotions are something that you can. And this latest incident could cost Odor and the Rangers somewhere down the line. All in all, the unwritten rules in baseball are silly and serve absolutely no purpose other than a testosterone battle and this incident will go on to prove it. Baseball is about winning games and titles. The best way to get someone back is to beat them over and over again between the lines. Other than that, this just reminds me of adults acting like kids instead of grown men. Good read. I can’t stand baseball’s unwritten rules. Never liked him as kid and hate them even more as an adult.